SAN DIEGO, CA--(Marketwired - February 21, 2017) - Mobile robotics are playing an increasingly important role in the security of our borders, military facilities, and even power plants. To meet this growing demand, San Diego-based NXT Robotics has developed Scorpion, a rugged all-terrain and all-weather outdoor security robot designed to provide organizations with round-the- clock physical security monitoring and reporting capabilities. 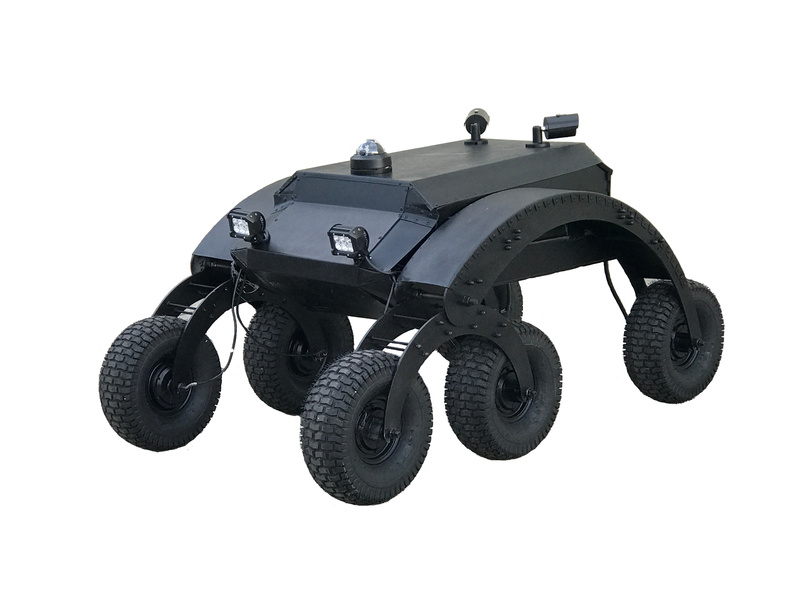 NXT Robotics, known for its advanced mobile security patrol platform, will debut Scorpion at West 2017 at the San Diego Convention Center, Feb. 21-23 (Booth 1208). Scorpion is an autonomous security patrol that lowers costs while maximizing physical security surveillance capabilities. Scorpion is designed for places such as military facilities, power plants, borders, parking structures, farms and ranches, and seaports. Scorpion's rugged outdoor design, multi-camera use, video capture and rich sensor payload helps secure assets and ensure public safety while navigating challenging environments. This revolutionary mobile platform can navigate paved or unpaved surfaces as well as steep grades. Scorpion can also be easily controlled via a mobile client or web interface. The sentry function is performed via user-defined routes and schedules. Optionally, each Scorpion can be automatically dispatched from NXT Robotics' INVISN™ 3D security appliance for maximum operational flexibility and convenience. The Scorpion supports indoor, outdoor, day or night security operations. With intelligent on-board analytics, organizations' data remains within their premise or data center yet the visual analytics and security awareness that they require are still available. Security managers can optionally connect to the NXT cloud-based visual analytics platform for enhanced results such as hair, shirt/trouser colors, abandoned package detection, license plate recognition (white-listing and black-listing), aggressive behavior detection as well as foot and vehicle traffic patterns for anomalous behavior/pattern detection. Scorpion can also address intruders in noisy environments via its built-in annunciator (bull-horn) capability. A remote operator can also speak through the annunciator and listen via the on-board microphone. "Smart infrastructure, cities and nations require seamless platform integration from their vendors," said Jeff Debrosse, founder and CTO of NXT Robotics. "Unmanned Ground Vehicles (UGVs) are becoming an increasingly popular choice for organizations that need to scale their operations while lowering costs and ensuring the consistency and quality of the results. NXT Robotics' ability to provide mobile and camera platforms with a cohesive customer interface to secure assets and safety is our niche in the marketplace." Stream H.264/H.265/MHPEG/JPEG and MPEG-4 video to ONVIF-compliant NVRs and security platforms. NXT Robotics is a San Diego-based company that provides service robots to support increased security monitoring and alerting requirements. The company's innovative autonomous platforms deliver security-related services to customers while meeting their performance and cost expectations for indoor and outdoor applications. NXT Robotics has also developed a new video analytic that detects handguns in use with real-time streaming video feeds or with pre-recorded videos. This is a major advancement for the security world because it can also be thought of as an AI-based silent alarm that constantly watches for these events.